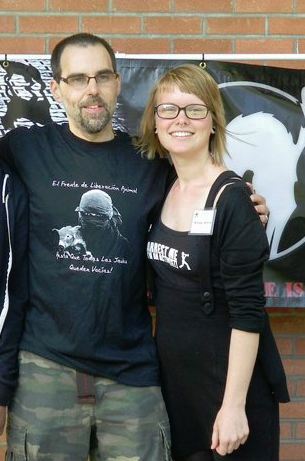 Camile Hankins (Win Animal Rights) – Extremist who has worked in campaigns against HLS. See more. Jason Miller (Thomas Paine Corner) – Pro-violence extremist, see more here and here. Jerry Vlasak – Still there, see above. I have no idea why such radical changes have taken place, however fractures in the animal rights movement have been common over the previous few years. Disagreements over tactics (violence vs non-violence) have been particularly pronounced in the last few years. The main subject of this post will be to investigate more about the activities and beliefs of newly promoted NAALPO press officer Nicoal Sheen. The name Band of Mercy was previously made infamous in the UK as the name for Ronnie Lee and Cliff Goodman’s extremist anti-vivisection group (both were arrested and charged with arson 1974). Prior to Band of Mercy, Greg Kelly had co-founded Win Animal Rights with high profile extremist Camille Hankins. In late 2010 Sheen became a press officer for the North American Animal Liberation Press Office. Recently Nicoal Sheen was interviewed by Jon Hoch in a piece which appeared on the online portal, The Scavenger. This piece allows us to better understand some of the beliefs of Nicoal. Let’s start with the issue of extremism. JH: Is there a line in the sand where you say, “OK, I’ll support these kinds of actions, but I won’t support those?” And if so, what is that line? I wonder whether she would support her colleague Jerry Vlasak’s support for the assassination of animal researchers? “[I]f an individual felt it was necessary for the oppressor to be assassinated, then sure, I would say they’re right in feeling that it would be practical and pragmatic to stop [the oppression]”. I had to read this a number of times to decipher the clever use of language. Rather than flat out agree that it would be right to assassinate researchers, Sheen has said it is right to feel that it is right to assassinate researchers. Is there a difference? I leave that to the reader to decide. However Sheen becomes a little clearer in her later statements (below). Interestingly, sheen also claims to campaign for reproductive rights, one has to wonder what her attitude is towards tha tactics used by anti-abortion extremists – tactics almost identical to those she endorses against scientists – to reduce access to legal abortion services. Maybe if something they care about—their property, their car—maybe if that is threatened—or their lives, they care about their lives—if that’s threatened, then maybe they’ll start to think about what they’re really doing and go towards a different avenue. […] I don’t even like to say that it’s violence. I like to say it’s justice, or extensional self-defense for these animals who can’t defend themselves. Same extremist fearmongering, different name at the bottom of the page – the next generation of extremists are born. Posted on August 17, 2011 April 14, 2014 by EditorPosted in Animal Rights News, NewsTagged animal liberation front, Animal Liberation Press Office, animal research, animal rights, animal testing, camille hankins, direct action, extremism, extremists, Greg Kelly, jason miller, NAALPO, Nicoal Sheen. Next Next post: Animal Rights Threats Not Welcome Here! You forgot to mention on Camille Hankin’s resume, “convicted animal hoarder and abuser”. But WAR still goes crazy and strong, they have a subgroup called Carriage Horse Cruelty, with an FB page. They have been relentlessly harrassing the NYC carriage drivers, disseminating complete lies and slander, and recently one of the barns had it’s locks vandalized and disabled. Plus the usual screaming at the potential customers to firectly interfere with their livelihood. The terrorizing of children is becoming a very accepted tactic, unfortunately. I feel for Tara, above, she is not the first nor will she be the last. There needs to be a bigger push to enforce the anti-terrorist act as it pertains to these crazies, what happened on the Miller Ranch, as in any number of cases, and vandalism on my own farm. Nicoal Renee is certainly a mentally ill fascist, surrounded by an ever growing and dangerous crowd just like her. I used to get enraged at these Animal Rights extremists, now I am both enraged and very, very afraid. These are not rational people. Nicoal Renee Sheen is a mentally ill fascist supporting the terrorization of my 2 young children on the Miller Mink Ranch this week. They have not been able to sleep through the night since. She is a coward and a liar.